Since V8, my savegame (and a new game) start with this error. Thanks for reporting. I'm really surprised by this error, but I could reproduce it easily when I download the AI through BaNaNaS and start RailwAI. If I extract the .tar file that was downloaded by openTTD to the AI folder, RailwAI starts without any problem. If I take a look at the .tar file, it seems that openTTD writes 3 bytes too much for the file shippathfinder.nut. 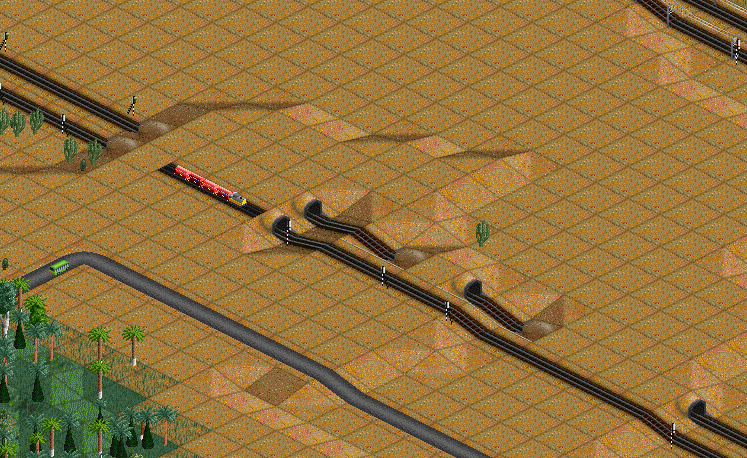 Usually this wouldn't matter because of zero-padding in the tar-files, but in this case BaNaNaS generated no zero-padding here I have opened an issue on GitHub about this bug in OpenTTD. Luckily I'm not dumb and with a slightly different file length, BaNaNaS does more zero padding. After a bit of development time in the last days (and a lot of testing time, mostly by running openttd in the background), version 12 is now available. I have implemented a small bit of strategy, with the goal of having more active train routes. Looking at the tests, it mainly goes at the cost of using less ships. Strategy: use more trains. Use less ships. Try to build more cargo routes. Bugfix: rail will be always connected properly when a rail station became accidentally a terminus station. A new year, so it's time for a new update. A few bugfixes, of which one was a major issue (concerning the finances): RailwAI loved to buy new road vehicles without giving them orders. Obviously, those vehicles were not really profitable. Good finding again. I directly made a change to version 14 that I was uploading, so that is now version 15. Adapt chances to pick a certain transport modality based on the company name. Ignore one-way roads in pathfinding. I don't know which change did the trick, but RailwAI seems to be doing better on sparsely populated maps now. Older versions would sometimes just sit there and investigate idea after idea, yet never build anything worthwhile or fail to establish a single route even. Perhaps industries and towns being placed much further apart than usual in comparison to the default map generator was something they couldn't handle very well.